Ever wonder what would happen if a rabbit and a sea slug had a baby? Turns out it would be pretty darn cute. The so-called sea bunnies - more formally known as Jorunna parva, a type of nudibranch - are taking Japan by storm, thanks to their adorable appearance. 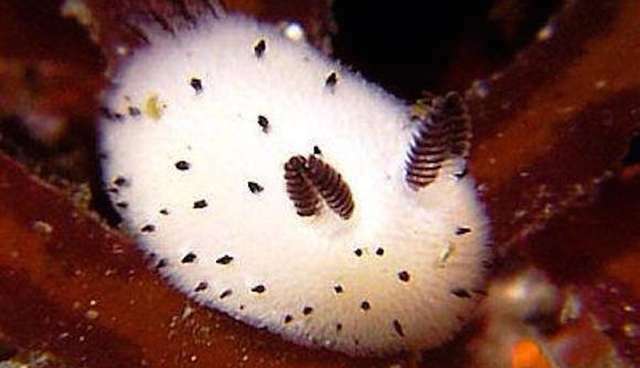 The fuzzy-looking slugs appear to have little ears on their heads, and even have a fluffy "tail" of sorts behind them. The little creatures can be found in places like Japan and the Philippines and are only around 2 cm long. And just like land bunnies, sea bunnies come in all different colors, including a very bright yellow. They can even have spots. Some sea bunnies are also a stunning minty blue - even land bunnies can't claim that distinction. After HairstyleNudibranch (Jorunna parva) Nikon d3x. 60mm. SB-105. But of course, you can't judge an animal without seeing it in action. Here's a video of a sea bunny squelching majestically across the ocean floor, her tail feathers blowing beautifully in the current. Here's a yellow one who's definitely wiggling his ear-feathers. And in case you need even more sea bunnies, here's a two-minute video of a sea slug doing absolutely nothing. We can't quite tell whether they're cute or slimy, but either way, we like them.